Cons The Kitchen Aid mixer is expensive and it's heavy. At 27 pounds (12.2 kg), it's a beast to haul around a kitchen, and should ideally have its own dedicated space. Summary This is a big ticket kitchen investment. It will handle nearly any cooking task, from heavy bread dough to whipping egg whites, and everything in between. These mixers also have the reputation of lasting a lifetime. 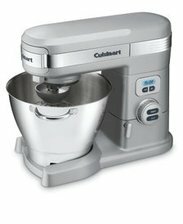 Pros The Cuisinart SM-55BC features an 800-watt motor and comes with a stainless steel bowl, paddle, dough hook, whisk, splash guard and recipe book. 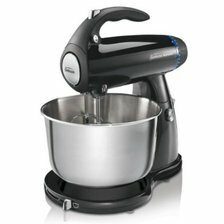 It has 12 speeds and users can buy numerous attachments for the mixer, similar to the Kitchen Aid. Cons Some users report the dough hook does not mix or knead dough very well. Others also say the lifting head feels flimsy, and the user has to scrape down the bowl too often. Summary The Cuisinart is a powerful mixer, and does many of the same jobs as the Kitchen Aid or Breville, with the advantage of numerous attachments to add versatility to the machine. It is comparable in price to both machines. Cons It is comparable in price to the Kitchen Aid, but some users report the motor tends to overheat if the mixer is used for heavy doughs. Summary The Breville is another kitchen investment. 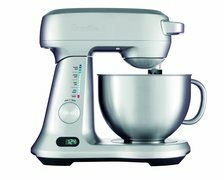 It is best suited for bakers and those who need a mixer to do a variety of jobs. It is powerful, durable and does almost everything the Kitchen Aid does, for a comparable price. Pros The Sunbeam MixMaster comes with beaters, dough hooks and a 4-quart stainless mixing bowl. 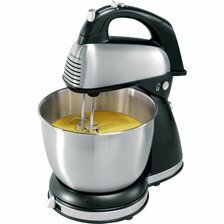 The 350-watt motor has 12 mixing speeds and the mixer features a tilt-lock head. Cons The dough hooks may not be able to handle large amounts of stiff dough. The beaters do not reach the bottom of the bowl, making for frequent scraping. Summary The MixMaster is good for most basic baking needs. It does not include a whisk attachment, which is desirable for most cooks, but will do most kitchen jobs. Pros The Hamilton Beach 64650 mixer has beater, whisk and dough hook attachments that will meet the needs of most home cooks. 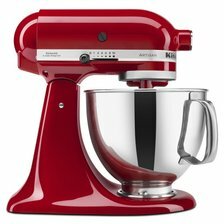 It is powerful enough to mix cookie dough, and the mixer unit will come away from the stand for use as a hand mixer. Cons This mixer is not suited for large quantities of dough, and may overheat. Users will need to scrape the sides and bottom of the bowl, in case the attachments do not get to the bottom of the bowl. Summary A good mixer that will do most jobs in the average kitchen. The attachments give it extra versatility, and the price will fit into most household budgets.